My husband's family is visiting from France, and he took them on a whirlwind tour of sub-zero Manhattan yesterday. Despite the frigid temperatures, the tree at Rockefeller Center still warmed their hearts. 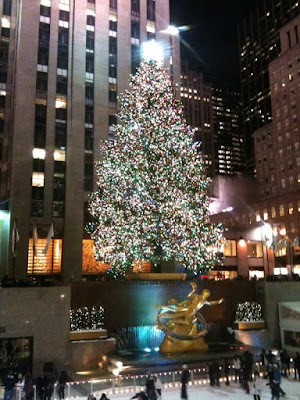 It is so beautiful & will always embody a special spirit of Christmas for me. Wishing you and your family a wonderful Christmas Eve. If you have a moment, I am featured on SprayGraphic in an artist interview. You can read it here. 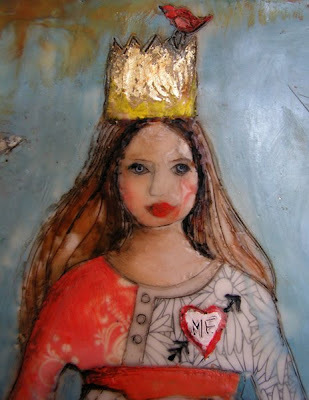 New Encaustic Painting: "I Know That You Love Me"
"I Know that You Love Me." Original is SOLD. 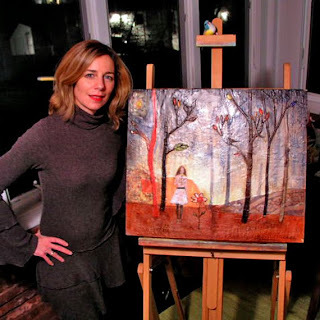 Here I am posing with my painting in the studio. I figured I would take the picture while wearing a matching sweater! 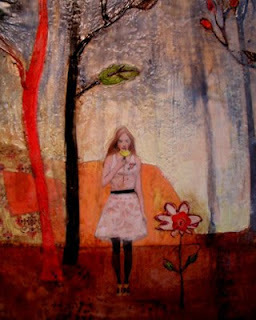 Detail of girl holding flower in the forest. A detail of the forest. And here is "I Know that You Love Me" temporarily hanging in our living room until moving to Caffe Portofino this weekend. 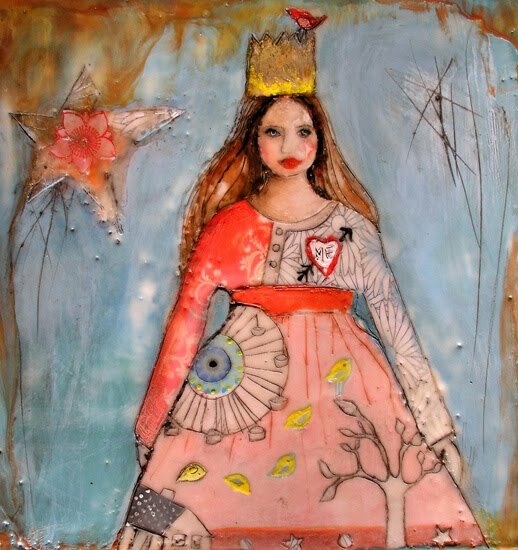 This painting is my first foray at making a larger-sized (28x20) encaustic painting, and it is my new favorite piece ever. It was quite an interesting (and somewhat challenging) process. The hardest part was applying the wax in my semi-freezing studio/sun porch. The porch is heated, but when I turn on my heat gun, a fuse blows all the time. So I usually just forgo heat in lieu of art-making! But with such a large area to cover with wax, it was tedius to apply the big sections of color (and to fuse them all with the heat gun). Yet I truly love this painting, and it will be hard for me to part with it. Yet "I Know that You Love Me" will soon be hanging in Caffe Portofino in Northport. This is because this beautiful cafe has sold 8 of my paintings in the past week!! So I had to create something new to replace them. I can't wait to put it up on the walls this weekend (though it does really match our living room!). My new "Beach Day" 10x10 Art Block on 2" Cradled Wood Panel. Available here. 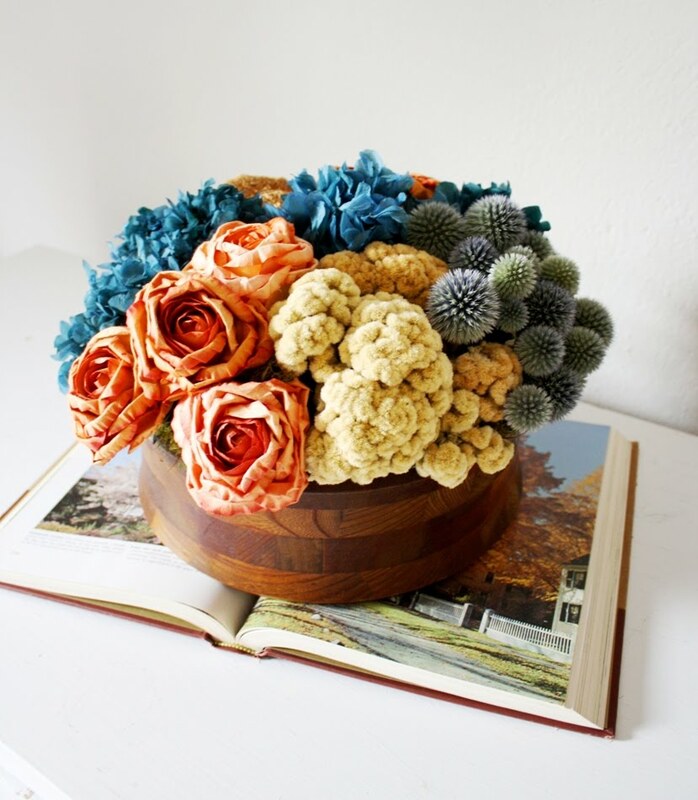 Beautiful Flower Arrangement commissioned by Dionne from Flores del Sol. Speaking of which, I have a winner for the Matteo Pericoli book, and it is none other than the lovely Gina Lee Kim. Thank you, everyone, for participating and for sharing your beautiful "out my window" views. And congratulations, Gina. I will be shipping your book shortly! A Very Special Giveaway -- ENDS tonight at 7 pm 12/5/09! Pericoli's drawing of the view from Mikhail Baryshnikov's window. 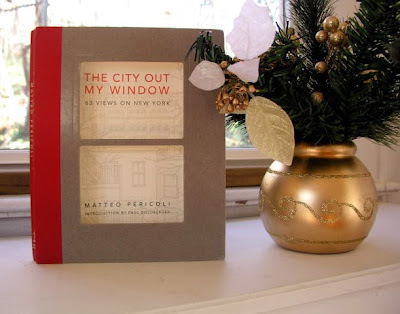 By a stroke of luck, I was contacted by the publisher of this wonderful book, The City Out My Window: 63 Views on New York, and asked to do a giveaway on my blog. Well, after reviewing my copy, there was no way that I could refuse! This is a gorgeous book illustrated by the amazing (and handsome) Italian architect, Matteo Pericoli. 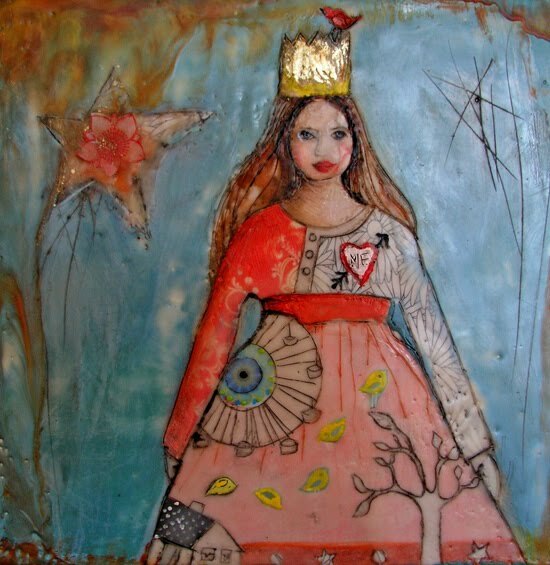 AND PS -- THANK YOU SO MUCH for the comments and support for my Holiday Boutique show last night. It went really well & was lots of fun. Love you all!!! I hope that you all had a wonderful Thanksgiving and are now happily full. I'm still looking forward to celebrating Thanksgiving tomorrow with friends and many toddlers. I am battening down the hatches! In the meantime, I'm having a SALE at my Etsy shop this weekend (starting right now!). FREE SHIPPING shopwide & 20% off prints. Please stop by .... no need to stand in line at 5 a.m. for a designer tote bag door prize. Just sit comfortably at your computer and have fun! 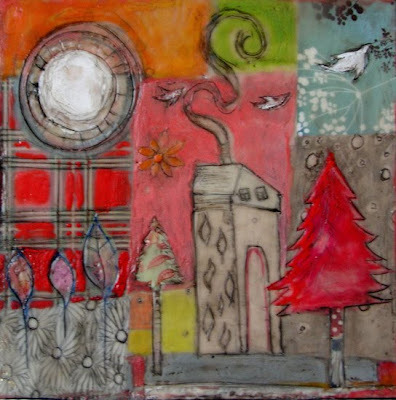 10x10 inch original painting: "Moon Song" encaustic on 2" wood panel - available here. 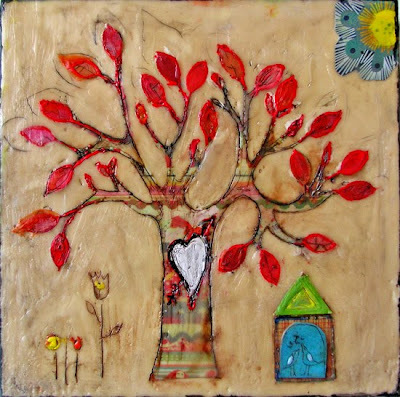 10x10 inch original & customizable encaustic painting on 2" thick wood panel : "Forever Tree." Original is SOLD. 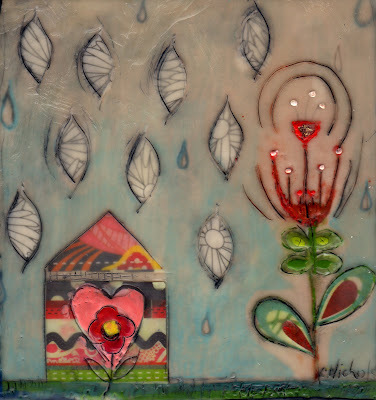 5.5 x 6 inch encaustic painting on wood: "Resilience." Available here. Oh my goodness, have I been busy lately. 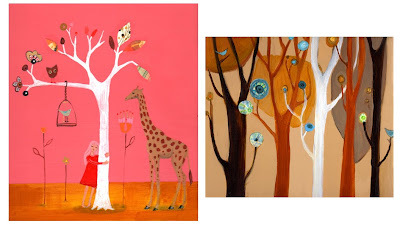 And today I finished 3 new paintings. Yes, there was a lot of coffee involved! I also had started them earlier in the week (or weeks), and finally had a chance to get them all done & uploaded to Etsy & my website today. Big news: I'm having a HUGE SALE this weekend (me & the universe, I know!). 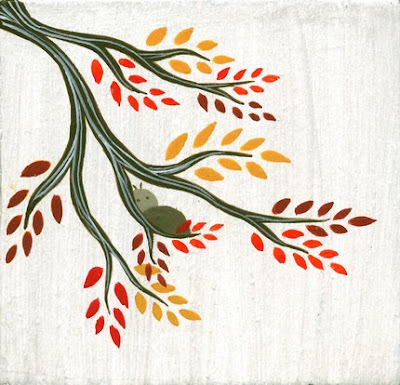 In addition to my Etsy Black Friday/Cyber Monday sale (news coming soon about that), I will be sending a 20% off coupon for my entire website at www.cathynichols.com to everyone on my email list. Today is the last day to sign up, so please add your email to the subscribe now button here on the blog if you'd like the coupon code. And everyone on my subscriber list is eligible for my free 10-pack of holiday cards random drawing. The cards just arrived tonight, and they are gorgeous. The image is of "Skate Away." "i am the queen of my imagination" 7x7.5 inch print on 8.5x11 inch paper. For sale here. I was able to take some pictures of my "queen" today, and here she is in totality. Though, I must say, it is very hard to photograph this painting. The wax is so 3-dimensional and shiny that the angle of light must be exactly right (it may call for a professional eventually). You can really see this when comparing the detailed image to the cast shadows included on the face in the full picture. 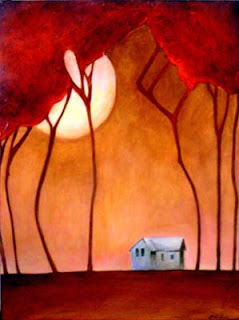 I am feeling the wisdom of Beth's advice to stick to painting 8x8 or smaller. Yet I am feeling a desire to go larger! I had such a great time creating this piece. I am thinking of yellow for my next work. Yellow and hopeful. 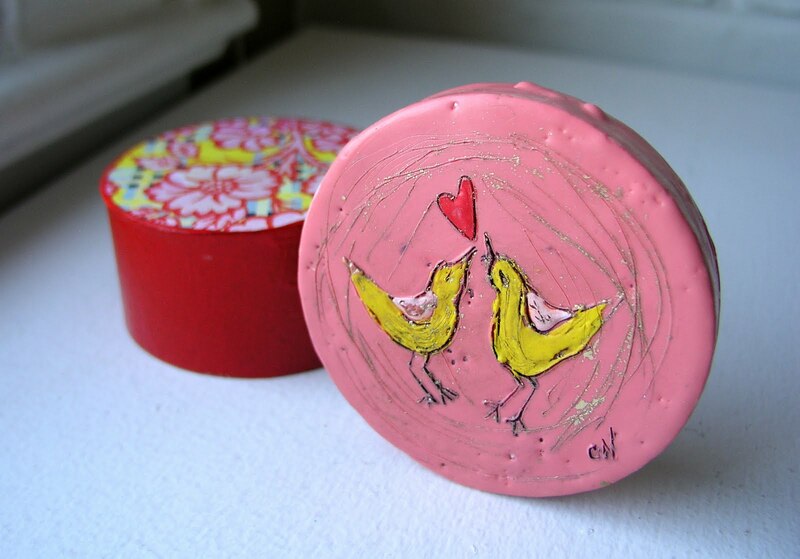 Hand-Painted Encaustic Gift Box -- "Pink Lovebirds." 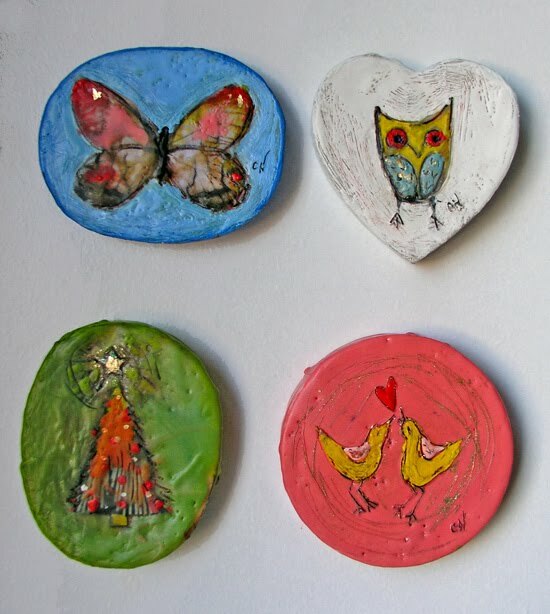 Encaustic "box top" Wall Art (buy set of 4 here). 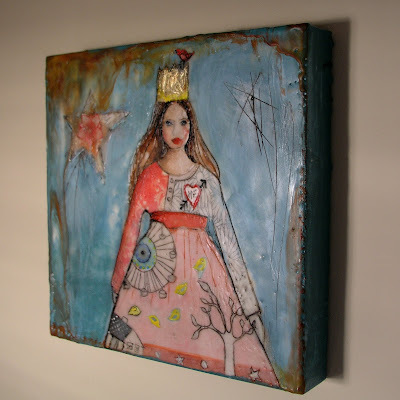 "i am the queen of my imagination" 10x10 original encaustic & gold leaf on 2" cradled wood. This is a section of the image. I finished this piece today while Christophe took the little ones to Gymboree, preschool and the library. I wish that you could see the whole piece because it has a greater impact in its full square proportions. This painting was such a learning experience for me. I finally got up the nerve to apply a full canvas of color (this blue), and I figured out how to include gold leaf (just rubbed it in -- how easy could it get??!). The crown is mostly gold leaf, and there are also incised gold portions of the star to the "queen's" right. My favorite part of this painting is the part that made me giggle as I inscribed it. It's word "ME" inside the heart on her chest. After all, she is the queen, and it's her imagination! :) I loved creating this painting so much. It will be hard to sell the original. But prints will soon be for sale on Etsy when I can photograph the whole thing. Stay tuned tomorrow for some special little gift boxes that I've been creating for the past week. They are super groovy if I do say so myself. 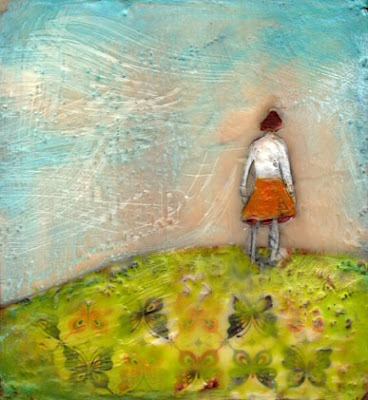 "Only the Beginning" 10x10 inch original encaustic painting on 2" wood panel. Original for sale on my website. 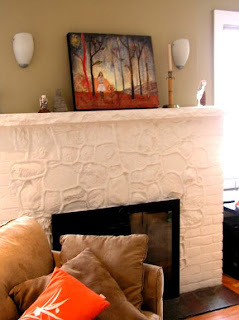 Here is a shot of the painting on the wall (next to my slapdash floral arrangement). As promised, I took some pictures of my newest piece to show the whole thing rather than just a portion. I had to take the pictures very quickly because the batteries were dying on my digital camera (and my son was tiring of the 3 toys in his playpen). 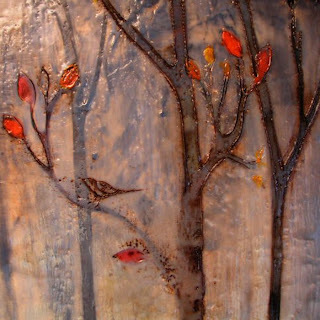 "Only the Beginning" excerpt from 10x10 inch original encaustic painting on 2" cradled wood panel. Prints are available here. This piece is a bit of a departure for me as it is a free-form sketch/collage in wax. I could only manage to capture part of the original painting on my scanner (it was too big), but I think it looks kind of cool cropped. I do, however, intend to photograph the entire piece as soon as the sun decides to return to our rain-drenched city. The inspiration for this painting is the Chicago song "Beginnings." I have not been able to get the chorus out of my head for 2 weeks now -- I've even etched it into this piece in tiny letters. This is such a happy song. Try singing the lyrics one day when you're in a bad mood, and see if it cheers you up. 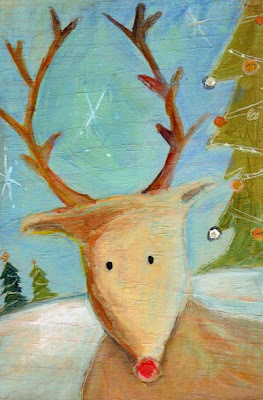 Thank You for Being "A Friend for All Seasons"
"A Friend for All Seasons" holiday cards available here. As a way of thanking my best customers & friends, I will soon be sending out a 20% off coupon to my email subscribers -- and I will send one randomly drawn name a set of my brand new "Skate Away" holiday cards and envelopes as soon as they arrive! If you'd like to join my mailing list just enter your email in the pink sign-up box at the top of my blog. And thank you as always & ever for being "A Friend for All Seasons." 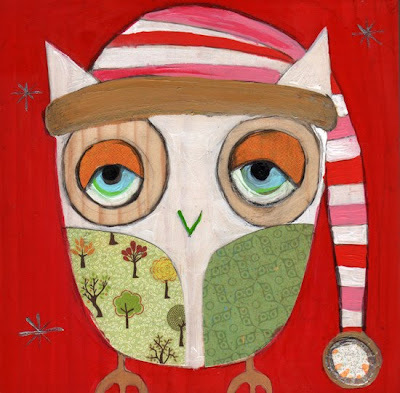 "Hoo Hoo Hoo" available here for the first time as a print for Christmas 2009! 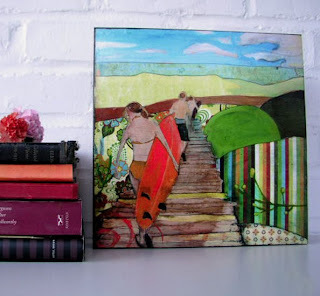 Double-sided Mini Paintings by Melissa Moss. Available here in her Etsy shop. 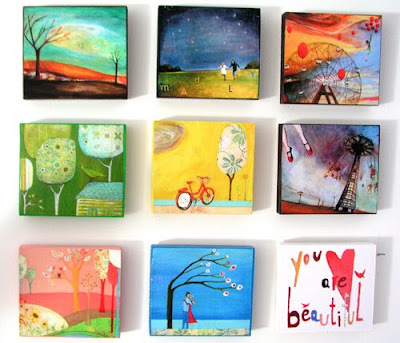 My lovely and talented friend, Melissa, has just posted 25 new Mini Paintings in her Etsy shop, and I just had to share them with you (before they're all gone). 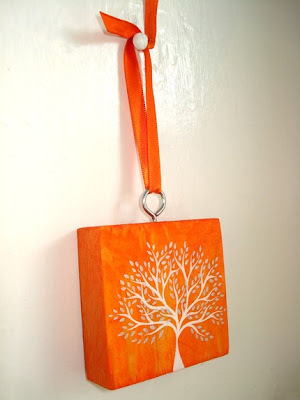 They are hand-painted tiny paintings that are strung from ribbon so that they can also be used as holiday ornaments. Best of all, they are only $35 each!! Check out all the paintings for some serious eye candy. First stop, Nahcotta Gallery. We paid a visit to the lovely Deb & Abbie, and I dropped off "MADLY" for the January 8th Verbatim show. I also showed them my new encaustic work (oh so professionally carried in a Halloween Jack'o Lantern bag -- at least it matched my outfit). And Brock & I checked out some of Rose Umerlik's gorgeous paintings. Her show is opening there tonight! Then it was on to a walking tour of Portsmouth. And some delightful wine & very intricate, complicated food that I can't remember too well after the wine at the cozy, jazzy Black Trumpet. Finally we settled back in for the night at the perfect Ale House Inn. Good Night, Portsmouth. You were one cool town. 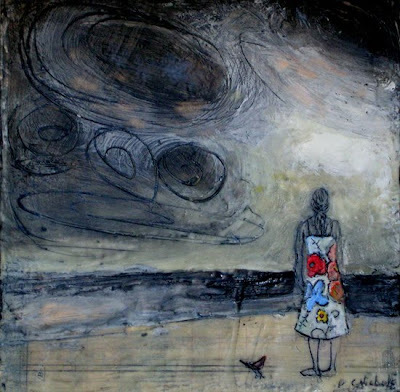 On the ferry home (from CT to NY), I received the happy news that two of my original paintings -- "Together You Are Less Lonely" and "A Home for Bluebirds"-- had sold at Caffe Portofino that evening. I can only say of the last 48 hours -- YAY! and THANK YOU to my mom for watching the babies and to Christophe for being the designated driver on this whirlwind road trip. 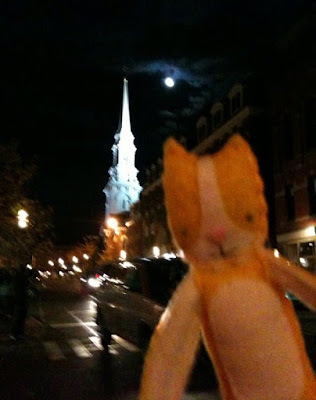 Meet new Travel Kitty (attached to my orange scarf) -- Brock Villagebrook! I purchased/adopted him from the lovely Lisa Dalton at the screening of Faythe Levine's Handmade Nation last week. If you can't see Brock clearly here (and really, who can? ), don't worry. Christophe & I are going on a small road trip to New Hampshire until Thursday, and Brock will be certainly be peeking in for some photo ops. 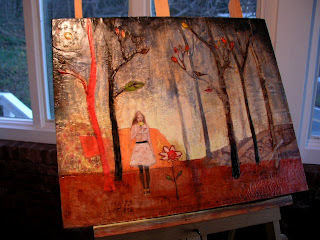 We are going to the Nahcotta Gallery to drop off my painting for the Verbatim show this January. 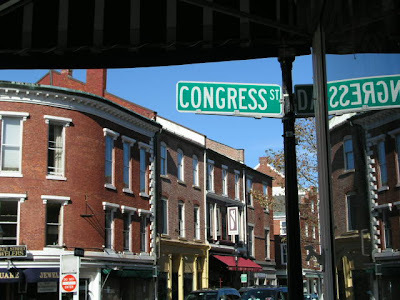 And we are very excited to see some more fall foliage and to sample the great shops & restaurants of Portsmouth. "Glow" 5.5x5.5 inch original encaustic painting on wood. For sale here. I've been so overwhelmingly inspired by the gorgeous fall colors here on Long Island. There is a certain tree that I pass by every day, and it just burns the brightest, most spectacular red. I feel like it must be shining with all of its might to stave off the inevitable loss of its leaves and onslaught of winter. 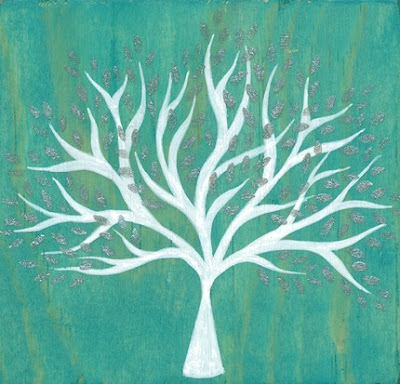 This painting is dedicated to that pretty tree (and to all of us who warm the cold days with out brightness). PS -- right now the original of "Glow" is for sale at my Etsy shop, but I can create a print for you if you would like. Just email me! 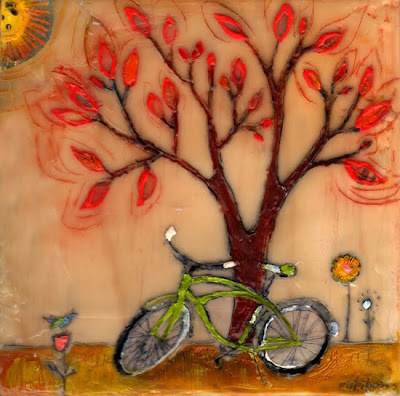 10x10 inch original encaustic painting on 2" cradled wood panel. For sale here. This is a new encaustic piece that I completed this afternoon. I have been thinking of this one for a few days now. I must say it was quite a challenge painting his beach scene using encaustics. It made me long for my sweetly obedient acrylics. But I do like the ethereal, somewhat mysterious effect of the wax. And I like the girl's flowery dress set against the dark background. I think it seems quite symbolic of her feelings of hope for her beloved's return. 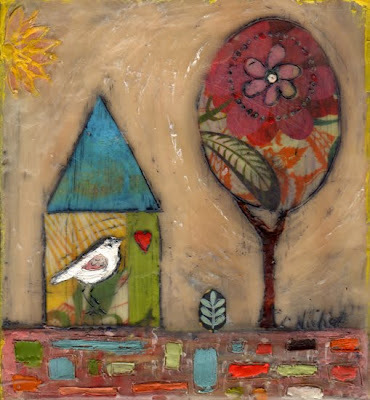 "Love Lives Here" original encaustic painting 4.5x5 inches. Available here for purchase. I've been so busy this weekend with the 20% off sale & lots of painting. Visit my Etsy shop to take advantage of this sale for 1 more day. Just type "Weekend Deals" in your message to seller & I will refund 20% of your entire order through Paypal. 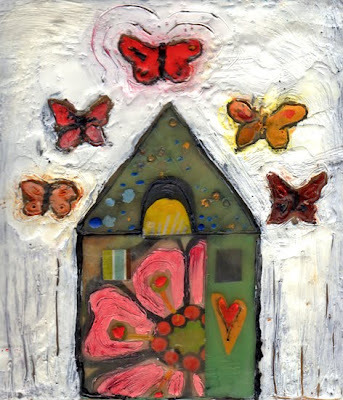 "The Place Where my Heart is Quiet' -- 8x8 inch original encaustic painting on 3/4 inch wood panel. Available to purchase here. "A Song For You." 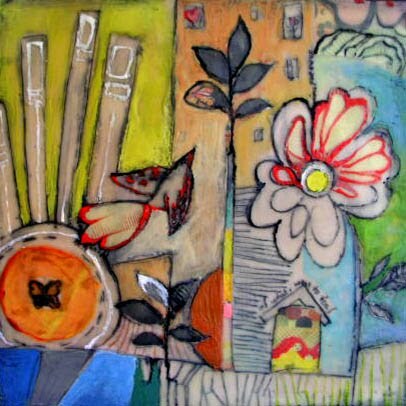 5.5x6 inch original encaustic and mised media on wood panel. Original has been SOLD. Oh how I wish there were more hours in the day. These are my latest encaustic works. They were both labors of love, but "The Place Where My Heart is Still" is very special to me because it seemed to have a mind of its own. My initial idea was a bit different than this one, and halfway through I stopped for lunch and told my family that I had 'hurt' the new painting. 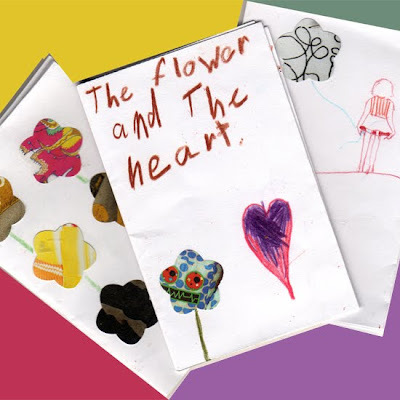 Axelle responded VERY sagely for a 7-year-old. "That just means it's real. " How smart is she?! Anyway, I went back to work and let the 'realness' take over. The result is a piece that looks different than planned but feels exactly right. Speaking of Handmade Nation, or well, handmade things... my stepdaughter, Axelle, and I created mini origami books today. Look at these cuties. You would be amazed at how long a 7-year-old can be enthralled by a flower punch, old magazines, glue & her imagination! "then there was you" 5.5x5 inch original encaustic painting on wood panel. Original has been SOLD. I'm very proud of this piece because of the incredible work that went into detailing both of these figures and their ensembles. I am not working with a stylus, so everything here is either etched in wax or painted directly with a (now nearly melted) bristle brush. 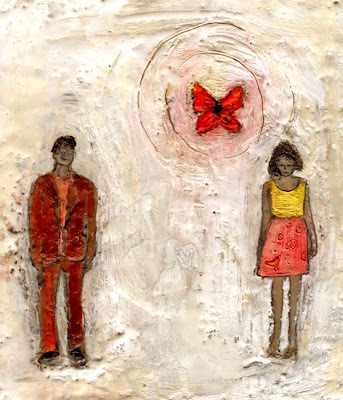 I love the bright vivid color of the couple & red butterfly against this vibrant, sculptural white wax. I must take 3d pictures and post them tomorrow. The scan doesn't quite do the painting justice. Meanwhile, if you are in the online neighborhood, please visit me at the Poppytalk Handmade Marketplace tomorrow. 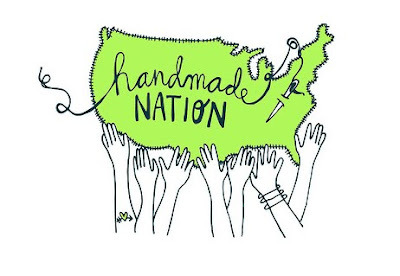 My work will be part of the "Indie Love Pre-Holiday" market. 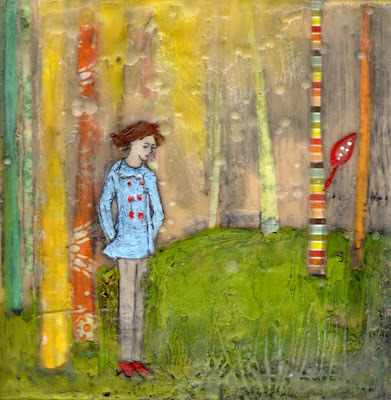 "Waiting for my True Love" 5x5.5 inch original encaustic painting on wood panel. Original is SOLD. Thank you, Carren. Ahhh.... let me just say right now that I am VERY EXCITED. 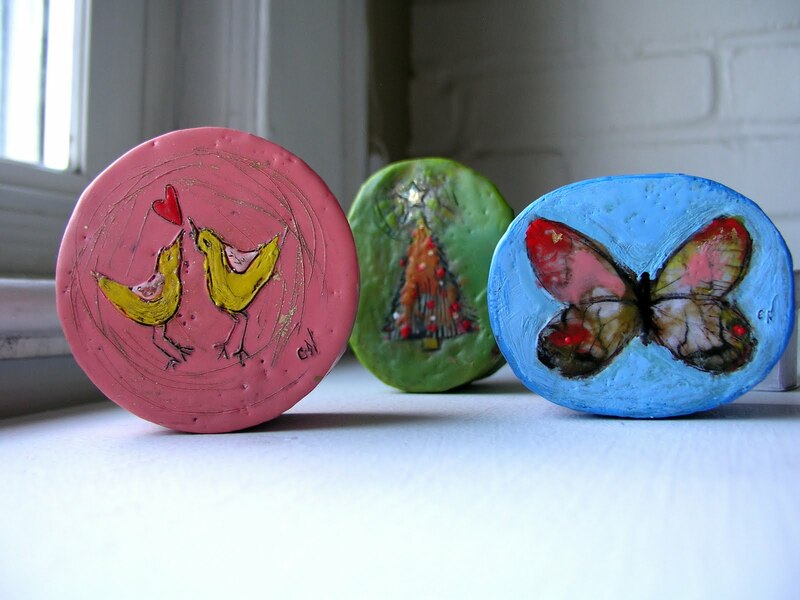 About four years ago, I fell in love with encaustic painting. There is something about the process of melting wax and carving, inscribing and transforming it into visual stories that just makes my heart sing. It's almost like cooking or... alchemy. And once I got started with it, I never wanted to stop. But then I had to stop when I was pregnant with Annabelle... then Nicolas. And even before Nicolas, it just didn't seem feasible to paint with hot wax in an unventilated apartment in NYC with a toddler sharing my studio. And, over time, I put encaustic painting out of my mind. My style, though -- even using gel medium & acrylics -- did retain some of this influence. Now, though, something very wonderful has happened. 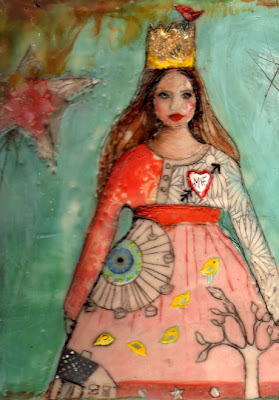 I've realized that I finally have a space to create my encaustic work again, and -- as a belated birthday present- -my husband has kindly helped me to re-furbish the tools that I left in Venice & sold in Melissa Moss's going away garage sale. The equipment arrived today, and I am looking forward to this renewed adventure. I spent most of the day yesterday creating these sweet little prints on wood for my Etsy shop. They all measure 4.5x5 inches and arrive ready to hang on the wall. These were my biggest sellers at the gallery in Venice, but I made them in a smaller size to accomodate smaller budgets this year. If you don't see your favorite, you can order a custom piece from me here. 2010 Wall Calendars are Here! 2010 wall calendars featuring 12 of my paintings are now on sale at my Etsy shop. In a very uncharacteristic move, I actually created 2010 calendars that are ready to purchase right now. Usually I think to myself, "hmmm... wouldn't it be a great idea to do a calendar this year?" sometime around December 15. And that is why this is my very first calendar. If you want one, though, please order quickly as there are only 16 left! I should have made more... but the limited quantity just makes them more special, I think. Harvest Moon - 8x10 inch print. Available here on Etsy. Tonight is the Harvest Moon, and it is just so darned beautiful as I gaze out my upstairs window. Is anyone else out there feeling particularly soulful this evening? It certainly has a magnetic energy. I hope, you, too are enjoying this gorgerous Fall gift. 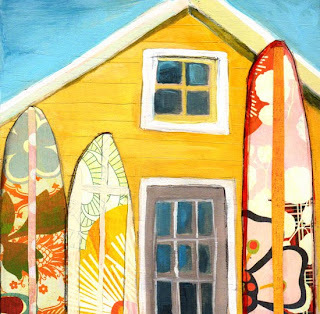 "Surf Shack" 5.5x5.5 inch original mixed media on wood painting. Click here to buy original. 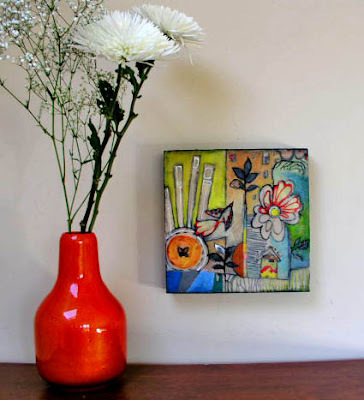 I've finally taken some photos of my new paintings, and I am busy uploading them to the Etsy shop. 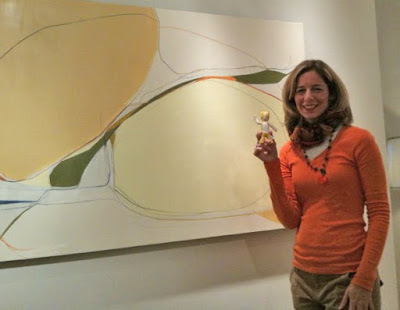 This happy little one was also inspired by my Amagansett trip. We bought some great surfing gear from this shop during our vacation! This original is now available for sale on Etsy. The others are coming soon. 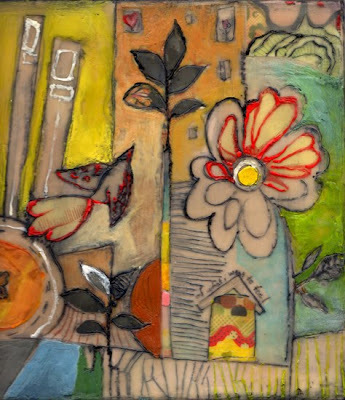 5.5x5.5 inch original mixed media painting on wood. Prints now for sale on Etsy. 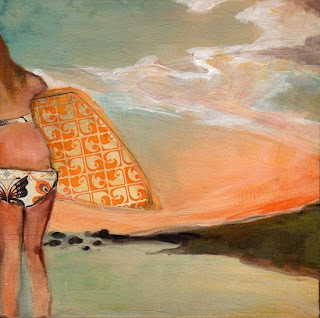 This is the newest in the surf series -- #10! 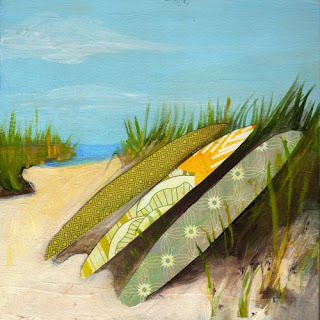 I was inspired by seeing these beautiful boards all laid out at the beach in Montauk. The real boards were pink & red, but there is something so refreshing about seaglass blue and green. It really captures the feeling of fresh sea air. Mmmm.... now if only I had some lobster. "Last Ride" 5.5x5.5 inch original mixed media painting on wood. I have decided to put the sweet little bear illustrations on hold until after Christmas when I have more time for their story (and when little Nicky bear starts school). In the meantime, I am continuing work on my surf series of paintings. This is #9 in the series, and will be available soon for sale on Etsy.